Taylors is thought to be the oldest lived in house in Surrey and dates back to the 13th century. 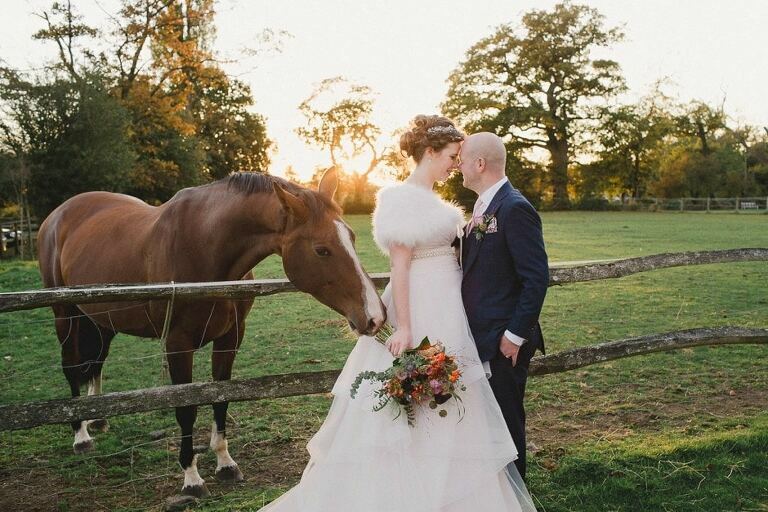 Set within beautiful grounds the barn overlooks the stunning Sussex and Surrey countryside and was Fiona and Steve’s choice for their wedding reception in October. I originally met the couple at their friend’s wedding (Louisa and Bevis) and with Bevis recruited as Steve’s best man, I knew this was going to be a great wedding full of laughs. The day started at Fiona’s parent’s house with the ceremony taking place at a nearby church. From there they headed to Taylors Barn arriving just in time for the golden hour before sunset. After some champagne and group shots I took the newlyweds around the grounds for their couple shoot. Fiona’s bouquet proved to be flavour of the month with the horses that seemed to appear everywhere we went and this made for some hilarious photos. As the night drew closer it was soon time for the wedding breakfast in the beautiful barn that had been decorated to perfection. All three speeches had the room in stitches and it’s always at this time when I really get to understand a little more about the groom with funny anecdotes from the past! Fiona and Steve then lead the way to the dance floor for their first dance and the night finished off with their friend spinning the tunes into the night. I really loved working with this amazing couple and all of their family and friends. Here’s some highlights from the day……..
For more information about Taylors Barn Retreat please click here.